Christianity is a minority religion in Libya. Since Roman times it has always been present in Tripolitania and Cyrenaica. The largest Christian group in Libya is the Coptic Orthodox Church (Copts in Libya), with a population of 60,000. The Coptic Church is known to have historical roots in Libya long before the Arabs advanced westward from Egypt into Libya. However, the Roman Catholics have a large number as well, with 50,000 members. Orthodox communities other than that of the Egyptian Copts include the Russian Orthodox, Serbian Orthodox, and the Greek Orthodox. There is one Anglican congregation in Tripoli, made up mostly of African immigrant workers, that belongs to the Egyptian Anglican diocese. The Anglican bishop of Libya has his seat in Cairo. There is also a priest in Sabha. There are relatively peaceful relations between Christians and Muslims in Libya. However, there are restrictions for Christian religious activity. It is prohibited to proselytize Muslims, even though a non-Muslim man must convert to Islam if he wants to marry a Muslim woman. Also, religious literature is restricted. Currently, there are 60,000 Copts in Libya, as they have many roots in North Africa (primarily Egypt). Historically speaking, Christianity spread to the Pentapolis in North Africa from Egypt; Synesius of Cyrene (370-414), bishop of Ptolemais, received his instruction at Alexandria in both the Catechetical School and the Museion, and he entertained a great deal of reverence and affection for Hypatia, the last pagan Neoplatonists, whose classes he had attended. Synesius was raised to the episcopate by Theophilus, patriarch of Alexandria, in 410. The Council of Nicaea in 325 made Cyrenaica an ecclesiastical province of the See of Alexandria. The Pope of Alexandria to this day includes the Pentapolis in his title as an area within his jurisdiction. The Coptic congregations in several countries were under the ancient Eparchy of the Western Pentapolis, which was part of the Coptic Orthodox Church for centuries until the thirteenth century. There are about 50,000 Roman Catholics, mostly Italian Libyans and Maltese Libyans. The Church of Santa Maria degli Angeli (Our Lady of the Angels) in the Old City - Medina of Tripoli was founded in 1645 and, with the permission of the Sultan of Constantinople, the Church of the Immaculate Conception was founded in Benghazi in 1858. 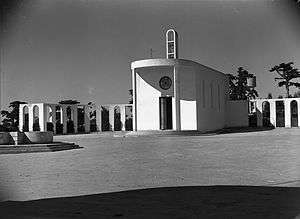 Before World War II the number of Catholics increased in Libya due to Italian colonialism. The Catholic Cathedral of Tripoli (built in the 1930s) was converted to a mosque. Roman Catholic Vicariates Apostolic exist in Benghazi, Derna and Tripoli. There is a Prefecture Apostolic in Misrata. There are two Bishops, one in Tripoli (Bishop Giovanni Innocenzo Martinelli - serving the Italian community in the Church of San Francisco in Dhahra). and one in Benghazi (Bishop Sylvester Carmel Magro - serving the Maltese community in the Church of the Immaculate Conception). In February 2014, east of Benghazi, seven Coptic Christians were dragged out of their houses in the middle of the night, shot in the head execution-style, and killed. On January 12, 2015, twenty-one Coptic Christians were abducted by forces of the Islamic State of Iraq and the Levant. On February 15, 2015 those twenty-one Christians were executed by Islamic State of Iraq and the Levant Shown in a video "A Message Signed with Blood to the Nation of the Cross." In spite of this opposition, a 2015 estimates some 1,500 believers in Christ from a Muslim background residing in the country. 1 2 Kjeilen, Tore. "Coptic Church". LookLex Encyclopedia. Retrieved 30 January 2016. 1 2 Larkin, Barbara. International Religious Freedom 2000: Annual Report: Submitted By The U.S. Department Of State. Diane Pub Co. ISBN 0-7567-1229-7. ↑ "ISIS claim abduction of 21 Christians in Libya: activists". Agence France Presse. Daily Star Lebanon. January 12, 2015.